In mid December of last year, I wrote a large article on the “The Battle of Shaykh Maskin” describing how that battle between mostly moderate and Arab states-backed rebels – the so-called “Free Syrian Army” – and troops of the Assad regime developed. At this point, rebels were able to capture and secure some 75% of the city, however most of its strategic military installations remained under the control of the Syrian regime army. Shortly after that article – around Christmas 2014 – severe winter started in southern and central Syria, stopping most of the fighting for a couple of weeks. It became very quiet around this stratagic town of Shaykh Maskin, being the gate to Izraa and Garfah, both located on the M5 highway, the only remaining land bridge between the regime-held Damascus area and the major city of Daraa in the south of the country.The attached map (not by me!) show how thin the respupply line to Daraa is right now and that regime forces are under extreme threat to lose its remaining strongholds in the south. Cutting this bridge would at the same time equal a huge advantage for rebels in Syria’s south, one of the last places across the country, where the pro-democracy revolution was not hijacked by islamist extremists or – literally – destroyed by the Assad regime. Howsoever, information started to flow again on January 25, showing major developments on the fronts across the northern part of the city. This indicates that the (almost) media blackout over the last month was deliberately to not reveal too much about the usage of fresh weapons and troops used in the offensive. 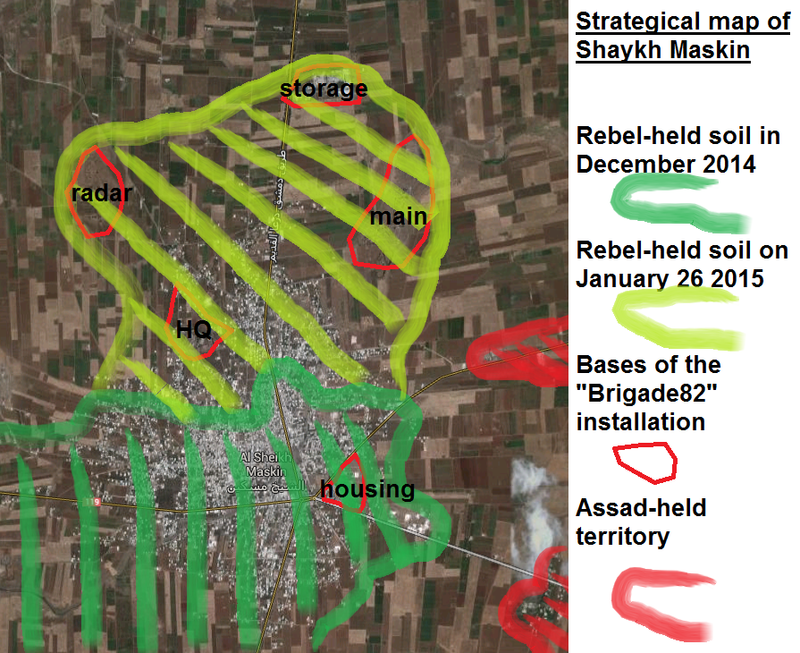 From precisely geolocated footage, it became clear that rebels were able to capture all remaining military installations across the town, namely the Brigade 82 headquarters on a hill overlooking most of Shaykh Maskin, the main base to the north east of the town, the radar base where rebels were able to seize an SA-6 and the weapons storage base some 3 km north of the city. The below map shows all advances between mid December 2014 and January 26 2015. The battle for Shaykh Maskin lasted from for a duration of almost 3 months and ended with the total victory of Free Syrian Army and other rebel forces. This is another indication that – different from the Damascus region, Aleppo and areas mostly to Syria’s western borders (with the sea and Lebanon) – the regime control over southern Syrian is increasingly diminishing and about to collapse during 2015. This can be mainly explained by the close-by Syrian-Joranian border via which weapons and trained fighters seem to enter Syria since several years, sometimes more, sometimes less. Those forces are trained and armed by other Gulf states with the consent of the United States, being proven once again by the modern weapons used in the battle for Shaykh Maskin and its eventual fall to the rebel army.